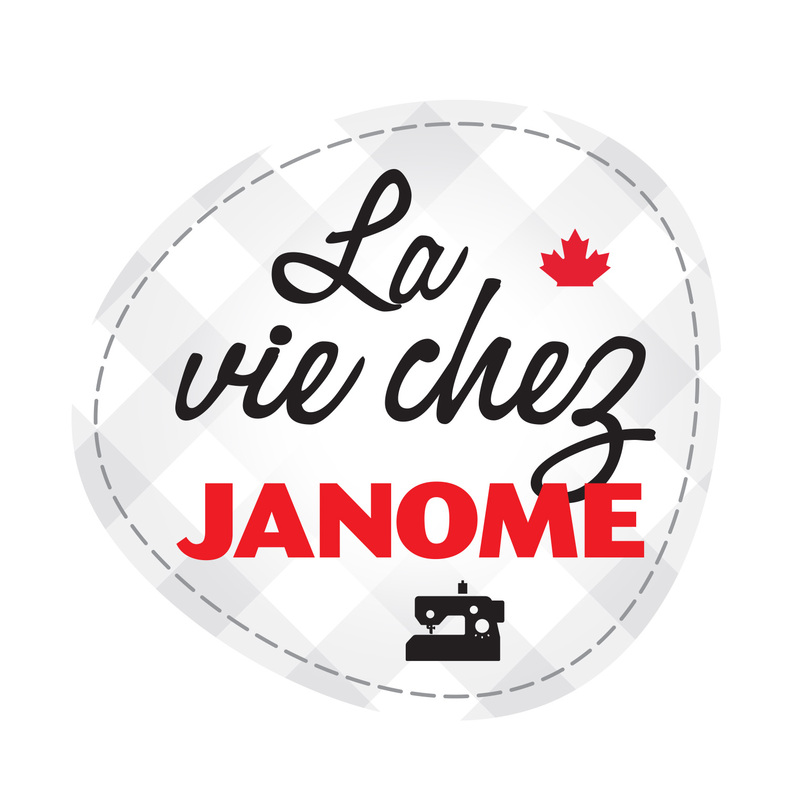 As shared a few weeks back……I did a road trip around the BC Interior visiting a number of Janome Dealer’s stores. At some stores I offered a Master class intensive 1 day workshop for owners of our Janome MC12000 & MC15000. 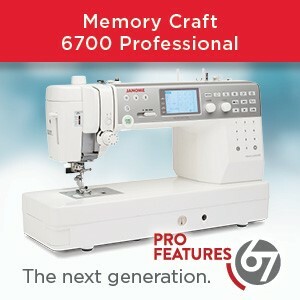 This is a wonderful opportunity to learn more about these incredible Top of the Line Janome sewing & embroidery machines. 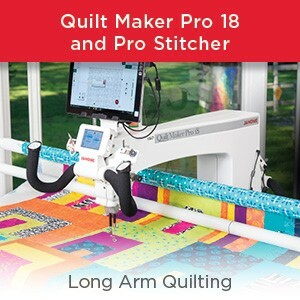 At all of the stores I visited, customers were invited to come to a Quilting Workshop where the purpose of the class was to make a little project while trying out several of our Janome machines. In much the same way that you would test drive a car before buying it, it is a good plan to sit and sew at a Janome machine to see what they offer, how they feel and ask the Janome educator questions. The project the customers made was a mug rug or mug mat (or coaster) which had several different quilting techniques to practice and learn. Everybody who attended went home with a completed project……..which is a big plus when so many of us have way too many PHD’s (Projects half done). 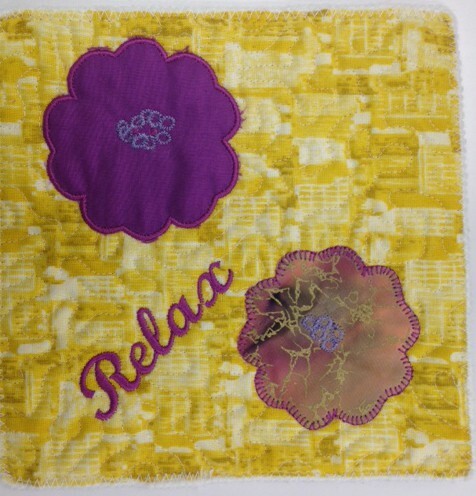 The mug rug was stippled ahead of time using the incredible JANOME ACUFIL Quilting system. The customers then appliqued around a pre-cut flower which was fused onto their mug rug using the JANOME APPLIQUE FOOT. They then used one of the following Janome sewing machines for this part of the project: Janome Horizon 8900 & 8200 & Skyline S5. Lastly the ladies also got to try out a JANOME embroidery machine (either a Janome MC15000, Mc12000 or Mc9900) to do another flower – this time it was applique-in-the-hoop + a word or two like tea time or coffee or relax as above. Lastly they learnt a neat technique to finish the edge: couching yarn against the trimmed & squared edge. 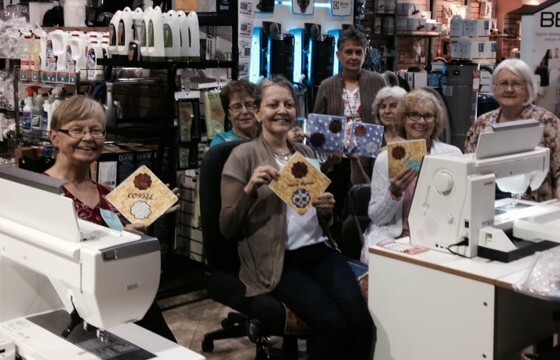 This group of Janome customers show off their mug rugs at Findlays Vacuum & Sewing in Vernon, BC. See upcoming blog post about this store. Seems like the customers enjoyed making this little project! 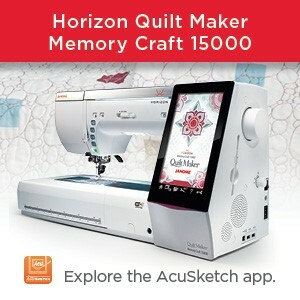 This entry was posted in ACUFIL QUILTING SYSTEM, Applique, Creativity, Digitizing, Horizon MC 12000, Janome Embroidery, JANOME EMBROIDERY SOFTWARE, Janome Fun, JANOME HORIZON MC15000, JANOME MC 8200, JANOME MC 9900, JANOME PROJECT IDEA, Janome Sewing Machine, Memory Craft 15000 and tagged ACUFIL QUILTING KIT FOR JANOME MC12000, ACUFIL QUILTING WITH JANOME, JANOME APPLIQUE, JANOME APPLIQUE IN THE HOOP, JANOME HORIZON 8200, JANOME HORIZON 8900, JANOME MC12000, JANOME MC15000, JANOME MC9900, JANOME SKYLINE S5. Bookmark the permalink. I wish I had known about your class! 😦 I didn’t find out about it until the weekend after. Ah well, hopefully I will be able to be a part next year (MC9900, bought at Findaly’s Vernon).